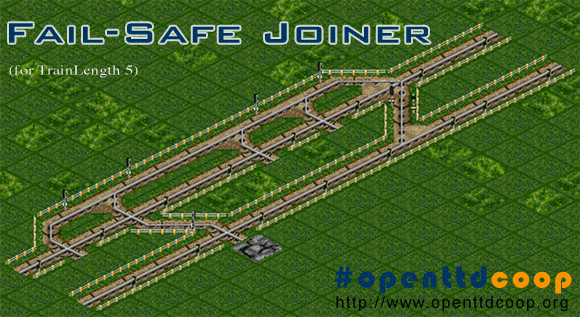 Whenever starting a new game, be it local or on #openttdcoop, one important question to be cleared before starting to build the network always is: “What tilelength (TL) are we going to use for our trains?”. The chosen setting will mostly depend on the size of the map, as you don’t want to have a hundreds train servicing a single coal mine on a 2048*2048 map. However, there is a great difference between using even tilelengths such as 4, 10 or 20 and odd ones like 5 or 11. The patch setting “When dragging, place signals every: X tiles” should always be set to “2” when playing on #openttdcoop, and most players will also use this setting if playing alone. If dragging signals, you will always have one piece of track with a signal on it followed by one without one and so on. Now, if trains are jamming up somewhere in the network, for example behind a full station, those trains should block as little space as possible, so that they won’t for example block the mainline. As you can see in the first screenshot, with signals every 2 tiles, the trains with tilelength 5 (left) fit almost perfectly in between the signals. However, the TL4-trains (right) always have a gap of more than one tile between them and need as much space as the TL5-trains. To fix that, you would have to place additional signals in the gaps, which might look ugly (especiall for straight track, see below) and is a lot of work, as you would have to do it manually. I got familiar with the tutorials and the videos I create. 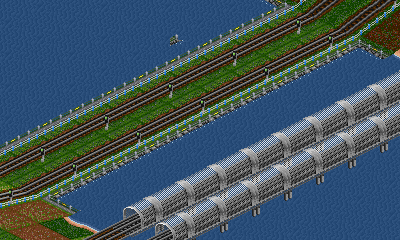 Today, I used a trick to create train tracks on sea level with sea around on the Public-Server. Due to requests I created this tutorial showing you how to do it and what you should care of. In my opinion the canals are more decent than a bunch of bridges. They also remind me of Sylt.